WELCOME TO DAY 4 OF MY 12 DAYS OF CHRISTMAS DECORATING, CRAFT AND GIFT IDEA CHALLENGE. Here is a quick glimpse at my outdoor decorations so far this year. We recently had two feet of snow….that I don’t think we really expected :), ok perhaps I was the one oblivious to the actual amount expected. The decorations are pretty simple and were very easy to do. 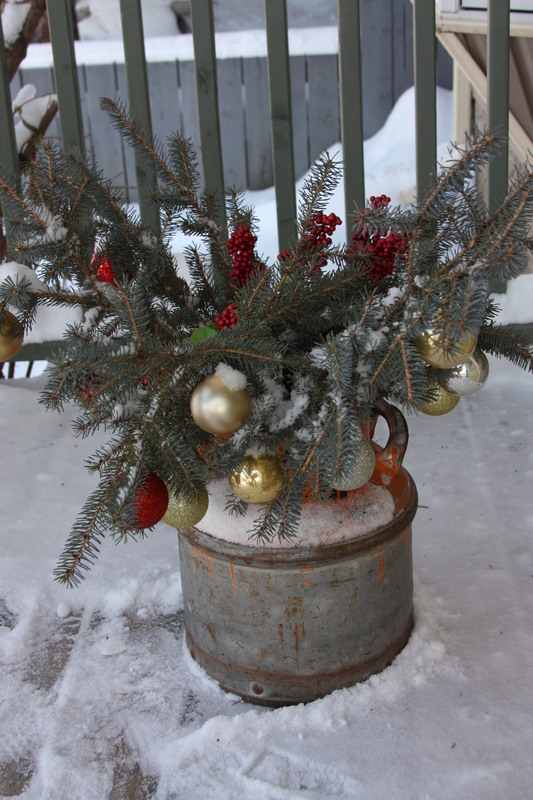 The first one is an old oil can that I picked up at an outdoor auction this summer and the branches are from the neighbors tree that hangs over our fence(the needles dropping in the fall drove me crazy but now the branches are useful so I’m ok with the trees now lol) …the balls are from The Dollar Tree as is the red spray of berries in the middle -the snow was FREE!! For the outside tree, I simply attached plastic ornaments a weatherproof tree topper, the snow filled in the rest of the branches for me. 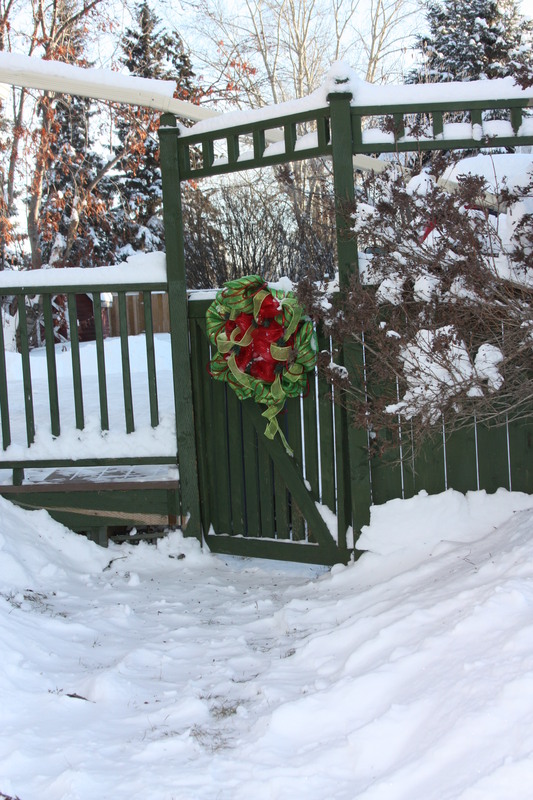 The pictures of the deco mesh wreaths are ones I made in 2012 – the first one I made for myself and used that year. The second one was for a customer at a craft show that changed her mind. I think it worked out perfectly as it matches the colors of my house and the screen door. 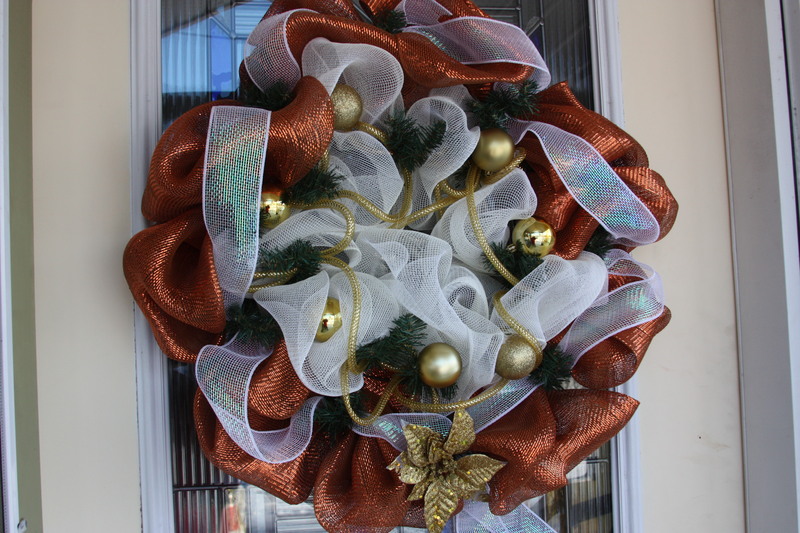 Here is a great link to how to make a deco mesh wreath if you are interested in making one of your own. I would love to see some of your outdoor decorations, please send me pictures, I can always use the inspiration. Simple, easy, inexpensive outdoor decorations, what A Wandaful Thing!!! This entry was posted in Decorate, DIY and tagged antique, Challenges, Christmas, Crafts, Decorate, DIY, easy, junk, ornaments, outdoor, reuse, snow, spray, tree topper, trees. Bookmark the permalink. Great shots. Love the wreath. Your right the snow does add to it.